Found it and got it for my bandmate five years ago, she's pretty much in love with this guitar, almost never wants to play anything else. Never seen another one like this. Great Video! Really enjoy listening to you play. Haha through the links under that video I just rediscovered your Hey tutorial, the part where you have a duet with your cat at 11 minutes took me out of the existential crisis I was having tonight and made me laugh. I like that one, too, the Retro-H Deluxe. It comes with a roller bridge and fantastic pair of mini hums which sound so nice. I had one for a while for a couple of years. You should set up an alert for those. I used to find them for quite cheap on Reverb and eBay. I got my red one for $200 with a nice soft case, too. I hate the Bigsby tailpiece for maintenance reasons (though I love their sound) so I prefer the Bangles signature which�has a full tailpiece instead. There's also the regular Retro-H with the female symbol on the 12th fret which is cool, but it seems a little empty cosmetically, so I prefer the Bangles signature of the various Retro-H shaped mini hum guitars. If you want to know what the Retro-H Deluxe can sound like in a band setting, I recorded a couple of songs with it on my band's album. Both these tracks use the Retro-H for the lead (normally I use my MG73). I know a band mix is kind of the worst way to hear a guitar, but I think it still has some of the sweet stock character, plus it has the unmistakable Bigsby sound in a couple places. 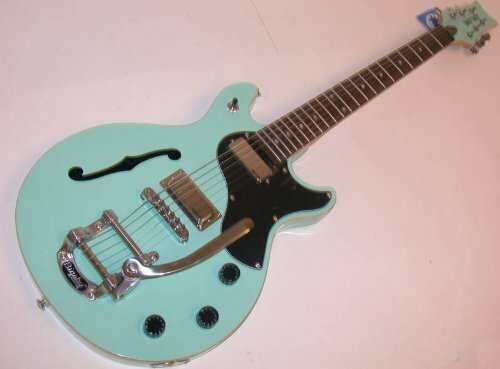 But back to my bandmate's guitar, what I've never seen in any other Daisy Rock is the combination of Tune-O-Matic, Retro-H semi-hollow body (adaptation of the Stardust Elite body), full-sized humbuckers, and that sweet, sweet, emerald sparkle finish. I absolutely love that one. When I found that guitar for her five years back, I knew it was perfect. Never seen any like it since. I think that was the moment I realized that guitar line sounded like a cat.